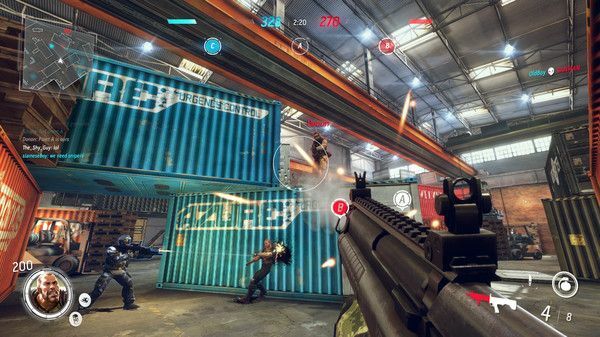 Rounds is a new game mode for Ballistic Overkill that sees two teams of up to 6 players fight to eliminate the other team, each player only has one life per round. It's a common game mode in other first-person shooters, one I actually quite like as it increases the intensity of the game. We will be launching the Beta version of the 'Rounds' game mode on Thursday evening (EST). This will be a game mode with up to 6 players on each team. Each round will last 90 seconds and if you are eliminated you will only be able to spectate your own team members. The winning team is either the team with the last member alive or the most living players at the end of the round. The overall winner is the first team to win 4 rounds. Even though it's a "Beta" you don't need to opt into anything, as it's in the public game. They said they would announce further details when it's live, but they haven't yet. I managed to try it out and the idea isn't bad at all, it does need a tweak once you die to actually allow you to change who you spectate, as it gets stuck following the person that killed you. Grab a copy from Humble Store or Steam. Little problem for those of us who play on 2560x1440. The UI elements are now scaled for 1080p it seems like. Reported it. You know what mode would be cool for this game? Capture the flag. Also, some new maps would be nice. But mostly though, I feel this game could use a round of general polish. It's still my go to online shooter, but it's been feeling a bit stale lately. This update should help with that though. I like the new mode. The UI is very clumsy and after death is annoying, but a little polish should fix that. Still desperately needs new maps. 'Rounds' in the wonderdome is a waste of time. Wish they would just come out with a map editor. So many terrible maps in that game. This is definitely one of my favorite game modes in any FPS game. I'll have to give it a try. Anyone else having graphics issues on NVIDIA since the update? Saw you play the game on twitch Liam, a few months ago, and decided to buy the game, but the game would not launch (but I don't have a standard rig, so I don't blame the devs). I think I'll give it another go anyway, this seems like a very good FPS! They seem to have pushed an update that breaks vulkan and causes graphical issues. launch options "%command% -force-opengl" is a work around for the moment.